You may not believe the fact that Ottogi is South Korea most successful instant noodle brand on par with Samyang(Thank Wikipedia). This Instant noodle has been in Malaysia market for quite sometimes without anyone noticing. You should start going to nearest supermarket and gaze on the shelve for any of these left. Since everyone is giving all the credits to Samyang hot and spicy instant noodle, somebody should give one or two reviews on Ottogi Cheese Instant noodle. Samyang hot and spicy noodle is too much to bear even for those who are seasoned spicy food consumers. Since we do not want to disappointed all the Oppa or Unni at Korea, we must at least buy Korean products in order to showcase our love to Kpop. The least thing we can afford to do is buy their not-so-overpriced instant noodle. Imported instant noodle always start as low as RM15 to as high as RM30 for 4 or 5 packs. I bought 4 packs of Ottogi Instant noodle for RM18.00. Estimates RM4.50 per pack. 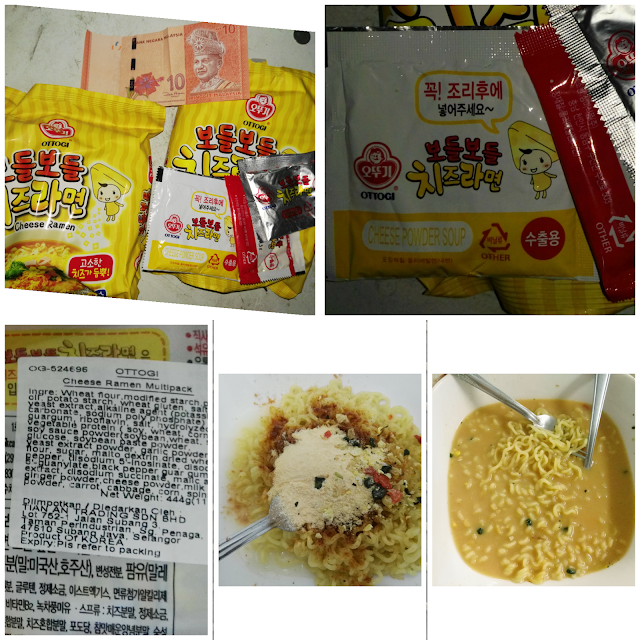 I am not from a rich background but if we were to watch nice Korean drama and Korean movie on internet without spending a dime is enough to justify my spending spree on Korean Instant noodle. I am just redeeming my misbehavior. Ottogi Cheese Ramyeon is imported by Tian An Trading Sdn Bhd located at Subang Jaya, Selangor.